Nonprofit organizations that depend on the generosity of donors are currently facing an urgent threat as Congress considers proposals that will upend the charitable tax deduction. The Senate Finance and House Ways and Means committees have presented tax reform options to modify the charitable deduction as they consider overhauling America’s tax system. The Charitable Giving Coalition, a group of more than 60 diverse nonprofits, foundations and other charitable organizations serving communities across the nation, is working to ensure there is a clear understanding of how tampering with the charitable deduction could impact giving and hurt those who need help the most. According to a new report issued by Giving USA, those who itemized their charitable contributions made up 81 percent of the total estimate (nearly $229 billion) for giving by individuals in 2012. If lawmakers reduce the value of the deduction, other research shows that billions in donations would be lost each year and vital services and jobs could be cut or eliminated. Consider the millions who depend on a network of highly effective, compassionate organizations across the country that provide jobs, economic development, food, shelter and more. ● Meet the needs of the more than 10 million people that come to their doors for help and hope, regardless of race or religious background. ● Employ nearly 66,000 and engage more than 311,000 volunteers annually. ● 25 million nights of lodging. ● 30 million articles of clothing. ● 20,000 graduates from addiction recovery programs. The Salvation Army also relies on the generosity of Americans to provide food, disaster relief, assistance for the disabled and support for disadvantaged children, the elderly and the homeless. ● 30 million Americans in 5,000 communities with its 70,000 officers and employees and 3.3 million volunteers. ● provide critical services for up to 52 million people. ● employ more than 9,300 people and help mobilize 2.87 million volunteers each year. Conservative estimates indicate that limiting the charitable tax deduction could reduce giving by a minimum of 2.5 percent for United Way. That translates to $104 million, or 1.3 million fewer times that United Way could provide job training for an unemployed worker, home care for an elderly citizen, supportive housing for a single mother or a mentor/tutor for an at-risk youth. ● more than 16,000 households with $13.7 million in emergency cash to pay for food, housing, healthcare and other critical needs. ● more than 52 million visitors are exposed to masterpieces, marvels and modern works and ideas each year. ● $2.4 billion in operating expenses for nearly 200 Association of Art Museum Directors (AAMD) member organizations stimulate economies and sustain jobs. ● more than one-third ($840 million) of the operating expenses of the AAMD’s membership network are covered by tax-deductible gifts. That’s more than the combined operating expenses of 70 AAMD member museums in the following states: California, Florida, Georgia, Illinois, Ohio, Pennsylvania and Texas. 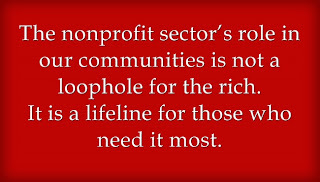 These vital sources of jobs, services and support depend on donations spurred by the charitable tax deduction. If lawmakers tamper with it, nonprofits lose their ability to provide food and shelter for the most vulnerable, support education and better health, strengthen communities, solve problems and more. 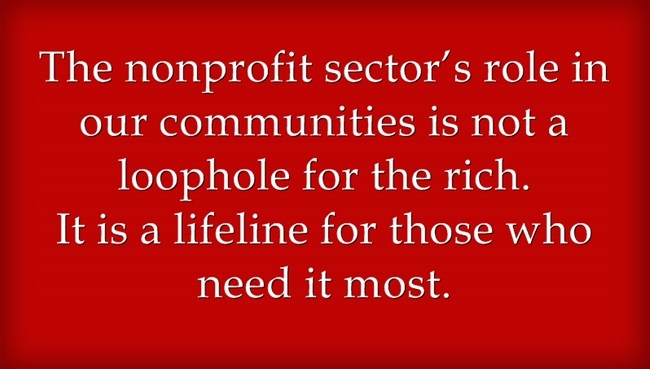 Let’s be clear, the nonprofit sector’s role in our communities is not a loophole for the rich. It is a lifeline for those who need it most. At a time when the need for crucial services is on the rise, we should be working to find ways to encourage more giving, not less. Rev. Larry Snyder, president of Catholic Charities USA, is a member of the Charitable Giving Coalition, which is dedicated to preserving the charitable giving incentive that ensures that our nation's charities receive the funds necessary to fulfill their essential philanthropic missions.